For years, the phrase "you are what you eat" has been a wellness-community favorite. While historically speaking, the belief has been pegged around our physical state (and quite annoyingly, the unique shape of our bodies), the correlation between diet and emotional well-being has slowly gained some ground as well. The concept: What we eat could have a direct impact on our mood, with inflammation-promoting foods like sugar, processed fares, and refined oils precipitating conditions like depression and/or anxiety, while whole, nutrient-dense foods might promote clear-headedness, happiness, and health. Of course, it's never quite that simple, and it's inevitable that each of us will respond to certain foods uniquely. In other words, this is why your friend might swear by the keto diet while the same approach makes you lethargic and grumpy. 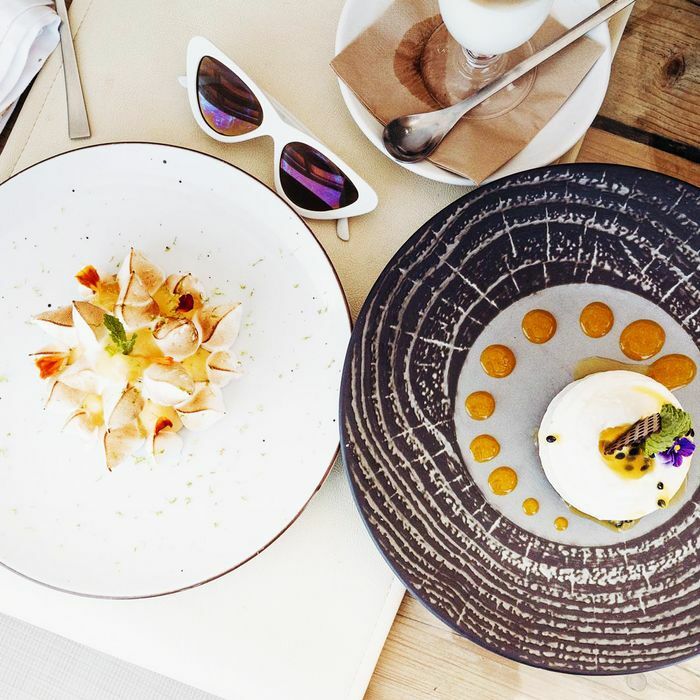 Here on The/Thirty, we wholeheartedly believe in following your heart and experimenting with what kind of approach to food feels balanced, freeing, and healthy. With the holiday season and, let's be honest, its accompanying stressors encroaching, our ears perked up when we first caught wind of The Anti-Anxiety Diet, created by Ali Miller, RD, LD, CDE. It's a whole brain/gut/body approach, conceptualized to calm the mind while simultaneously diminishing worry and panic. In other words, the diet (which is detailed in Miller's book) embodies the ultimate food-as-medicine philosophy. For a full picture of the diet, we recommend snapping up a copy of Miller's book, which provides not only a helpful glimpse into her background but also a wealth of supplemental information and recommendations to incorporate the diet into your life. (Plus, she includes a thorough two-week meal plan and tons of yummy recipes!) That said, we're here to give you a glimpse into the diet, potentially inspiring you to see if Miller's anxiety-busting approach to eating might serve as a healthy and meditative guide. Curious to know more? Keep scrolling. We're covering what the diet is, what foods to embrace or avoid, and more. In a nutshell, the Anti-Anxiety Diet is designed to jump-start an anti-inflammatory approach to eating by reducing the intake of carbohydrates while increasing healthy sources of protein and fats with the goal of supporting brain health and, in turn, emotional well-being. 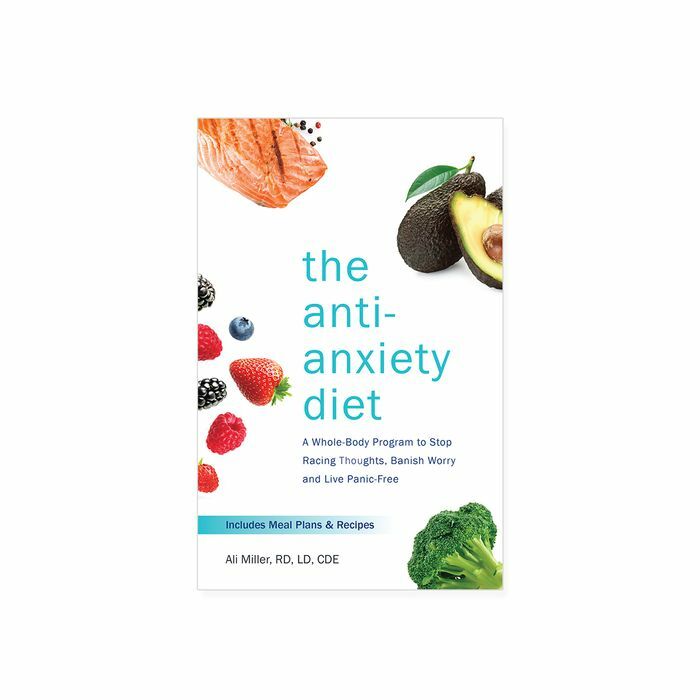 "The anti-anxiety diet employs tenets of each of the six Foundational Rs, focusing on removing inflammatory foods, resetting your gut microbiome, repairing your GI lining, restoring your micronutrient status, rebounding your adrenals, and rebalancing your neurotransmitters," Miller explains in her book. Essentially, the program begins with Phase One, a six-week mode of eating that encourages ketosis, thus requiring a very-low-carbohydrate approach to eating—think roughly 30 grams of carbohydrates per day. According to Miller (and some research), the production of ketones may help reduce anxiety while simultaneously supporting a sense of stability. Then, after six weeks of what Miller refers to as "tight ketosis," you'll transition to Phase Two, which focuses on foods with a low glycemic index. "In Phase Two, carbohydrates increase to a more flexible 90 grams, and you'll choose carbohydrates in the form of fruits and starchy vegetables to provide dietary variety, beneficial fibers, support of serotonin expression, and a reset in leptin response," says Miller. "Phase Two eating is one approach to carb cycling while maintaining ketosis from Phase One the majority of the time. Carb cycling may be done in times of progesterone shifts to offset the physiological hormone demand for a cycling female or once a week or every other week on a Saturday to create a sustainable approach and more social freedom." And while the second phase of Miller's Anti-Anxiety Diet allows a bit more wiggle room where carbs are concerned (unlike Phase One, you can eat fruits, legumes, and starchy vegetables), it will still remove carbohydrates, gluten, corn, soy, sugar, and dairy for a total of 12 weeks with the goal of balancing blood sugar levels and supporting consistent, balanced, and healthy mood and energy levels. So this is important. Remember what we said earlier about everyone having different biological reactions and needs when it comes to food? Despite the potentially advantageous outcomes of eating MIller's anti-anxiety way, there are still certain constrictions Miller wants readers to take note of. Since both phases of the diet are fairly stringent in nature (although, Phase Two is slightly more flexible), the diet isn't for everyone, especially pertaining to the first phase which will require more dramatic adjustments to your eating habits. "Depending on where you are with your current diet and your medications, a ketogenic diet may be too drastic and you may choose to stay within the low-glycemic Phase Two protocol to kick off the anti-anxiety diet," Miller states in her book. She recommends forgoing Phase One of the diet if you have an uncontrolled medicated diabetic, a history of disordered eating, are pregnant, or suffer from adrenal fatigue. "If the adrenal output is extremely low, you will not have DHEA, a stress hormone made by the adrenals used in the production of ketones. Some individuals with advanced adrenal fatigue need to practice two to three months of Phase Two eating prior to applying the anti-anxiety diet," she explains. Again, although this is a very basic overview (her prescription in the book is incredibly detailed), Miller explained to us via press release that the most important foods to include and exclude in your Anti-Anxiety Diet go as follows. "Anxiety can be caused by an imbalance of neurotransmitters—either too much excitatory compounds or too little inhibitory or mellow out compounds," Miller explained. Therefore, since the production of balanced neurotransmitters is accomplished through a happy and healthy gut, it's important to choose nutritionally dense foods in their whole form to ensure we provide our bodies with optimal building blocks for neurotransmitter balance. "By giving your body the nutrients it needs to balance neurotransmitter production (and removing foods that can get in the way of that balance) you can equip your body to fight anxiety responses at the source," she concludes. "Just as your diet can serve as a support for optimal mood function, a diet that is high in gluten, soy, corn, dairy, and sugar can interfere with neurotransmitter expression and drive inflammatory activity, increasing anxiety and mood disturbances," Miller explains. "It can seem intimidating at first to remove so many things from your plate, but there are plenty of resources to help you thrive on an anti-inflammatory diet." Plus, in addition to making the above prioritization when it comes to diet, Miller also points out the importance of other lifestyle factors that will further enhance your anxiety-busting efforts. For instance, she emphasizes the importance of daily movement; practicing breath and mindfulness; prioritizing sleep hygiene (see our guide here! ); and experimenting with relaxation techniques and gentle movement therapies such as Pilates, yoga, barre, hiking, and even stretching. Next up, see how going 100% plant-based completely changed one editor's approach to diet—and understanding her body.